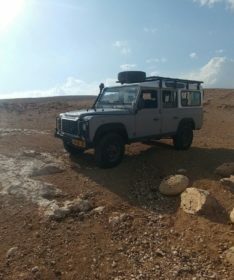 We begin with a challenging descent diagonally between the narrow walls of the canyon towards the Dead Sea, sometimes even sitting on the canyon floor. We will slide down the water-carved canyon and encounter five tall dry waterfalls along the way. We will traverse each waterfall by rappelling to the next level. The final rappel will place us near the beach of the Dead Sea.